Vice President Mike Pence has announced plans to establish by the end of the year a new space-focused military command that would be headed by a four-star general, The Washington Post reported Thursday. The plan includes the formation of a new “space force” as the country’s sixth service branch as early as 2020 in response to threats posed by potential adversaries, Pence said in his speech Thursday at the Pentagon. A senior official at the White House said the administration plans to work with Congress to introduce by early 2019 a bill that would set up a new military department. Defense News reported the proposed “space operations force” will offer space expertise to the space combatant command in times of conflict. 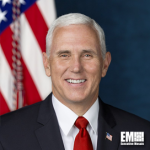 Pence said a new space development agency will be established to serve as a joint acquisition arm for space platforms and advance technology development through experimentation and prototyping efforts. He noted that the Defense Department will appoint a civilian to the new assistant defense secretary for space post to manage the space force’s expansion efforts and report to the DoD secretary. “This leader will be key to a critical transition to a fully independent secretary of the space force,” Pence added. The announcement came days after Defense Secretary James Mattis said that the Pentagon is supportive of a plan to form a new space-centric combatant command.